1. 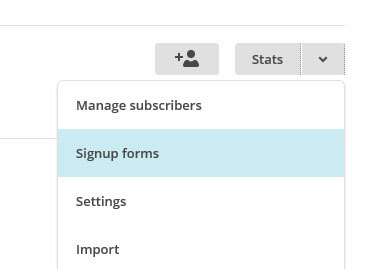 Click on List in the main menu on your Mailchimp account Dashboard. 2. Click on the down arrow next to Stats for the list you want to your visitors to subscribe to. Then click on Signup Forms. 4. Scroll down until you see the Sub-heading, Copy/Paste onto your site. Select all the code inside the box. Clicking inside the box should select it all. If not, click inside the box and press Ctrl+a. Then copy the code to your clipboard with Ctrl+c. 5. Past the code into a text editor on your computer. Look for the form action and copy the url. In the example, the form url is //businessplace.us5.list-manage.com/subscribe/post?u=a27db21a7d7d8dd3310687799&id=2785da9e7d. 6. Paste the URL in the Mailchimp URL box on your landing page’s options setting page.